The NAC-2 Core Autopilot Core Pack from Simrad consists of the low-current NAC-2 autopilot computer, Precision-9 compass and RF-25 rudder feedback unit and is the perfect set-up for hydraulic and mechanical drives on smaller vessels up to 35’ in length. Autopilot Core Pack – Just add Pump and Controller! The Simrad NAC-2 Autopilot Core Pack consists of the parts you need to start your autopilot system. Designed for inboard and inboard/outboard boats up to 35’ with hydraulic cylinders less than 15.2 ci, mechanical steering or solenoid valve steering (8 Amps continuous, 12 Amps peak). Simply add a display (AP44 or AP48) or a compatible Simrad chartplotter and a drive/pump if required and your boat is ready to drive you to the fishing grounds. The NAC-2 Autopilot Computer is the brain behind your autopilot system. It contains the control algorithms developed to steer a vessel across a broad range of weather and sea conditions. The Precision-9 Compass is a NMEA 2000 heading sensor that outputs heading at 20Hz (20 times per second), rate of turn at 20Hz, roll, and pitch at 10Hz. This all equates to you getting the most accurate heading data possible fed to the autopilot computer for faster and smarter control. The RF-25 rudder feedbackprovides engine or rudder angle to the autopilot computer. It is just more info for the NAC2 to provide smart steering. This data is also visible on the display which helps the captain know which direction the boat is steered when not in motion. These combined components matched with a display and drive (if required) provide for a much more relaxing day on the water or a better fishing experience by taking human error out of the equation. Simrad’s AP44 Autopilot Controller is perfect for the mariner interested in conveniently and easily controlling the functions of their autopilot. Rotary dial and button control, The AP44 has a 4.1-inch glass, color display. Simple setup and automatic tuning. Autopilot Core Pack Required. Not Included and Sold Separately. 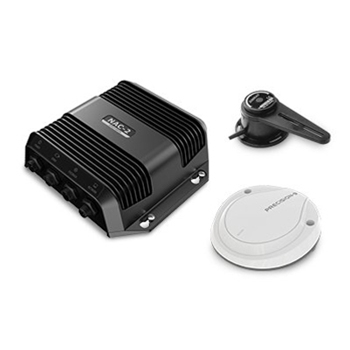 Simrad’s AP48 Autopilot Controller allows for complete control of your Simrad Autopilot. No Drift steering, depth contour tracking and automated turn patterns are all controlled from the 4.1” low profile, glass display. The Simrad RPU80 is a reversible hydraulic steering pump for the AC42/44/48 autopilot computer. Designed for boats up to 35ft with hydraulic steering of 4.9 - 12 ci.